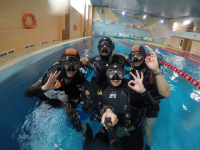 During a year volunteer instructors from the Afalina Dive Club will teach children scuba diving according to the program of the World Confederation of Underwater Activities (CMAS). In spring and autumn volunteers from the Afalina Dive Club cleaned up lakes in Tomsk. 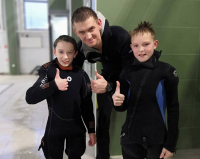 TPU-based dive-club Afalina will run a social adaptation course for freshmen and children left without parents.